Once the hot, humid weather is over, I can be a lot more flexible with my face products. I can go for a much more minimal look without worrying as much about my overly oily skin. In the cooler weather my skin leans more toward combination I would say. 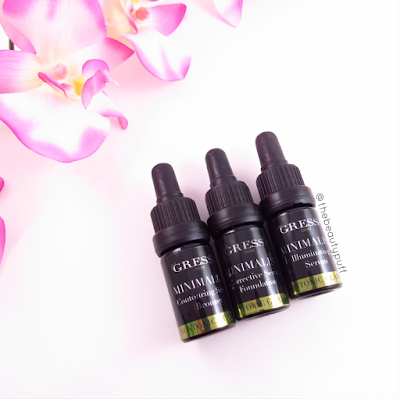 During this time I can enjoy products like Gressa Skin Minimalist Serums, which provide a natural look with the benefits of multivitamins to improve my skin's overall condition. Each of these serums comes with a convenient dropper to dispense just the right amount of product - and you don't need much! Before using each product, just be sure to shake well. I dispense a little at a time on the back of my hand and use a brush to distribute. My favorite part about the formula of these products is that they are incredibly easy to blend and achieve a natural finish. There are no harsh lines and the product does not set immediately so you have time to blend to perfection. The foundation provides natural coverage and feels weightless on the skin. I like how it wears throughout the day without getting greasy or feeling too oily. It provides a natural radiance to the skin, giving a healthy glow. You can get even more of a glow with the addition of the illuminating serum. In a concentrated drop it looks almost iridescent but when applied to the skin it gives a natural luminescence. There is no glitter or unnatural finish, just a beautiful light-catching highlight to finish off your natural look. You can also add a drop or two of the illuminating serum to the foundation for an all over glow. For added depth, the bronzing serum is perfect. 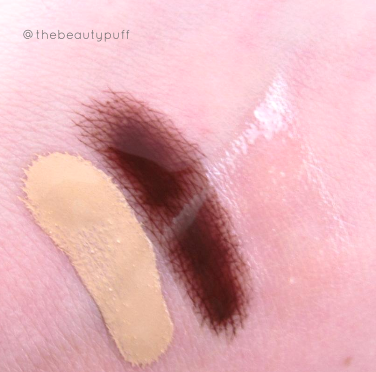 At first swatch it looks quite dark, but it blends incredibly well with no streaks or unnatural lines. It is buildable so you can easily add more depending on your skintone or desired look. I use a stippling or duo fiber brush with this serum in particular so I can apply a light layer and add product accordingly. These serums hydrate, protect and even help treat skin conditions such as rosacea and acne. They also have the Gressa Healing Complex which is a combination of botanical extracts which help keep skin clear, balanced and radiant. If you have oily skin (like me) you can definitely add a translucent powder to prevent any excess shine but still maintain the natural finish. I think these products are great for everyday use and especially on days where I want an even skintone without an overly "made up" look. Overall, these serums help keep my skin beautiful on the inside and out.